People get so excited about the NBA trade deadline because it holds the promise that something transformative can happen — that a team can be remade, reloaded, revolutionized. On Thursday, we saw the flip side of that — the dark side of the trade deadline. Wednesday night — against a Knicks team still reeling from the resignation of its coach, Mike D’Antoni — the Portland Trail Blazers got embarrassed, losing 121-79. It was the kind of loss that suggested their season could be over. The next day, owner Paul Allen made sure that was the case. Over the course of one work day, Portland traded two of its key veterans, Marcus Camby and Gerald Wallace for not-Ricky Rubio (Johnny Flynn) and not-Roy Hibbert (Hasheem Thabeet), released their former no. 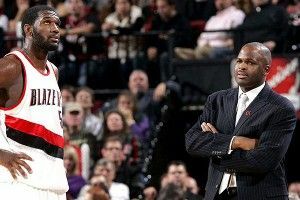 1 draft pick, Greg Oden (aka not-Kevin Durant), fired its coach, Nate McMillan, kept the two players who were reportedly undermining him — Raymond Felton and Jamal Crawford — and promoted a former unpaid intern, Kaleb Canales, to replace him. Look at that last paragraph. Now imagine the second half of “Layla” playing over it. This was housecleaning that even the characters in Goodfellas would applaud. And just as ruthless. Sure, the exacting McMillan’s message was probably being tuned out, and at 20-23, trending somewhat downward, there was little need to keep old-timers like Camby and Wallace on the books if they could get prospects and draft picks in return. But McMillan had helped revive basketball in a great basketball town, with the thrilling 2008-09 team. And Wallace had become a local favorite ever since arriving from Charlotte. These moves might ultimately make sense (ESPN’s John Hollinger gave the Blazers an “A” grade for their deadline day moves), but nobody, least of all Portland fans, will feel good about them. You know what they say about tearing off the Band-Aid instead of peeling it slowly? They might be right, but it still hurts.